Sanghameshwara or Vijayewara (as formerly known) temple would have been established in the time period of 696 -733 when Pattadakal was under the rule of King Vijayaditya Satyashraya of great Chalukya dynasty. 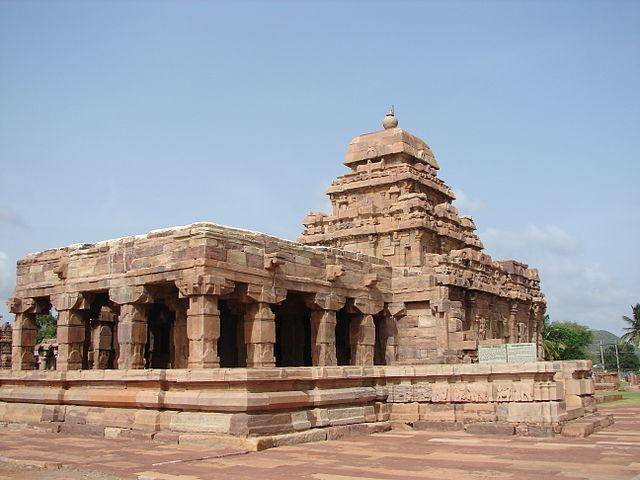 Sanghameshwara temple is the oldest temple of Pattadakal. This is the temple which doesn’t consist of Sukanasika. You can see a passage and hall enclosing the sanctum sanctorum. Built in Dravidian Style, the temple has statues of Ugra Narasimha and Nataraja carved on the outer walls of the temple. Raised over a platform of square shape, the temple has three storeyed Vimana. Underneath Storey of Vimana was wrapped by two walls. The middle storey is just the extension of innermost wall which wraps the lower storey. The outermost wall spreads across the Paraghara which encloses the main sanctum sanctorum. The temple has old inscriptions which states that the land was gifted by Vijayaditya to construct the Sanghameshwara Temple.